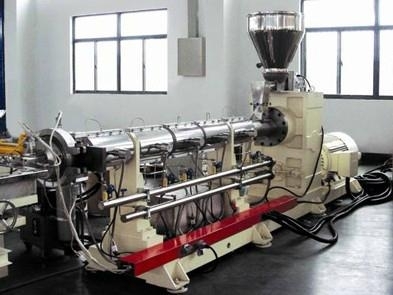 Manufacturers of single screw extruder, the screw is divided into three sections:general feeding section, a compression section, homogeneous section. The feeding section of the bottom through the small, the main role is to transportmaterial to the rear section, so the main problem is conveying capacity, parameters(L1, H1), h1= (0.12 - 0.14) D. The compression section of the bottom after changing, the main role is to compaction, the molten material, build up pressure.Homogenization (measurement) section, transport and pressurization, the establishment of a certain pressure, so that the die materials has caused a certain density, and further mixing, and ultimately achieve the purpose of smooth extrusion granulation. Widely used color and regeneration of granulation production of PS, ABS, mixedPC, POM, PA, PP, PE, PVC, EVA, PET and other plastics. Single screw plastic extruder Hardened reducer, to ensure stable operation, no noise. 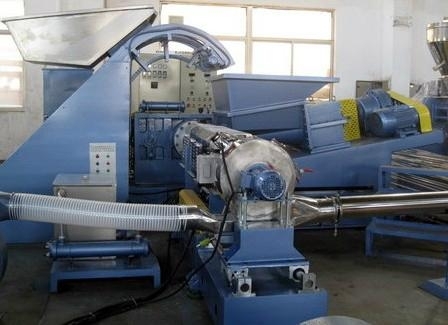 Instrumentautomatic control system: using the traditional relay electrical control, temperature control for advanced digital temperature control meter PID regulation, host, feedingrealization of interlock control, operation panel with heating wire break alarm and main auxiliary equipment operation control system. My company has 30 - Phi Phi 200 different length diameter ratio of single screw, is the production of PS, ABS, PC, POM, PA, PP, PE, PVC, EVA, PET and other plasticpipe, profile extrusion granulating or preferred choice, welcome old and new customers to our company to visit and guidance.